Known for his rambling, innuendo-laden style, and cheeky admonishments to the audience, Frankie Howerd had a roller-coaster career spanning six decades. Born in York but raised in London, Howerd spent his youth reading books and performing in plays. As a child he aspired to be a Hollywood star, but a rejection from RADA put paid to his straight acting ambitions. He began to entertain while on national service, and on demob in 1946, toured Britain in a show called For the Fun of It in 1946; and his profile rose when he was asked to appear on the BBC radio show Variety Bandbox. Howerd's gossipy and camp style, and catchphrases such as 'Oooh no missus' and 'titter ye not', gave him a distinctive style. Against the fashion for slick comedians, he was happy to admit when a joke had gone wrong or whether he’d simply forgotten it – and would dare to tell them audience to stop laughing so he could finish his stories. Howerd started to diversify in the Fifties: appearing in comedy plays, including playing Bottom in Midsummer Nights Dream, and films such as The Runaway Bus, and 1962's The Cool Mikado, starring Tommy Cooper and directed by Michael Winner. Howerd described the latter as 'the one production in show-business that I'm positively ashamed to have appeared in'. He fell out of fashion in the Sixties, and was hit with financial problems. But after a successful comeback cabaret performance at Peter Cook’s fashionable Establishment Club in Soho, Howerd was soon booked on new satire programme That Was the Week That Was. With jokes about politicians growing acceptable, Howerd grew popular again as he teasingly lampooned important public figures of the time. Howerd soon became a national treasure, appearing in TV shows and films such as Up Pompeii, Up the Chastity Belt, The Howerd Confession, and a number of Carry on films, including Carry on Doctor, and Carry On Up the Jungle. Though he was off the screens in the early Eighties, he found another new outlet in student crowds who were discovering the new alternative comedy, and saw Howerd as something of an iconic figure. He even addressed the Oxford Union in 1990. Howerd was gay, but publicly hid his homosexuality, which was illegal until 1967, for fear it would harm his career – although backstage he was known for making bold advances. In 1955, he formed a relationship with waiter Dennis Heymer, who later became his manager. He died in 1992 in his Somerset home of Wavering Down after suffering respiratory problems, linked to a virus he contracted during a trip up the Amazon the previous year. In 2008 a BBC biopic about his life, Rather You Than Me, was broadcast, based on interviews given by his Heymer. Howerd was portrayed by David Walliams. For a man who loved innuendo, he would be pleased to hear that in Channel 4’s 100 Greatest Stand-Ups, broadcast in 2010 and voted for by the public, he was placed at number 69. Sorry. 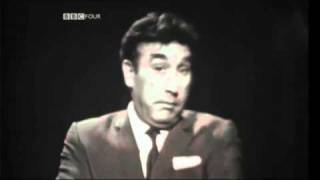 We have no reviews for Frankie Howerd. We do not currently hold contact details for Frankie Howerd's agent. If you are a comic or agent wanting your details to appear on Chortle, click here.